There is a good chance that you've got something in your kitchen from the island (tea, cinnamon, curry, or coconut oil), but where is Sri Lanka located? Travelers who have already been there sing the praises of the South Asian island. Still, Sri Lanka has mostly remained under the tourism radar, but probably not for much longer: Lonely Planet named it as the top destination for 2019. The name change may be one reason Sri Lanka isn't overly familiar to many. The country was known as Ceylon until 1972. But more likely, it's because Sri Lanka couldn't grow into a tourist destination until relatively recently, despite an interesting culture and beautiful surfing beaches. Sri Lanka's violent, 30-year-long civil war stifled tourism for decades. Leftover landmines don't exactly encourage exploration. Fortunately, the war ended in 2009, and Sri Lanka is drawing a lot of well-deserved attention. It's about time: the island is one of the most biodiverse in the world and boasts an astonishing variety of flora and fauna for its size. The beaches and interior alike are absolutely gorgeous. The two vie for days on adventurous itineraries. Falling in love with Sri Lanka's charms is way too easy! Known as Ceylon until 1972, Sri Lanka is an independent island nation located in the Indian Ocean just southeast of the tip of the Indian subcontinent. It was a British colony until obtaining independence in 1948. Along with India, Nepal, and the Maldives, Sri Lanka is considered a part of South Asia. Sri Lanka is in the Indian Ocean, almost rowboat distance from the southeast tip of India. It is located just a little southwest of the Bay of Bengal. The Gulf of Mannar and Palk Strait separate India and Sri Lanka. The Maldives, an island nation and popular honeymoon destination in Asia, are southwest of Sri Lanka. Sumatra, the largest island belonging only to Indonesia, lies far across the water to the southeast of Sri Lanka. Sri Lanka is thought to have once been connected to India via an 18-mile-long land bridge, however, now only limestone shoals remain. Large cargo ships transporting Indian exports from Mumbai to the rest of Asia cannot sail through the shallow waters between the two countries; they must pass all the way around Sri Lanka. Sri Lanka is a medium-sized island that occupies 25,330 square miles — making it only a little larger than the U.S. state of West Virginia; however, more than 21.7 million people call the island home. Imagine cramming the populations of Sweden, Norway, and Finland combined into a space almost the size of West Virginia (more than 10 times the population of the state). Making matters worse, much of the island interior is made up of uninhabitable waterways, mountainous terrain, and dense rainforest. Getting around Sri Lanka is easy by bus and train, although public transportation is often painfully overcrowded. Like India, you'll be inundated with offers from tuk-tuk/rickshaw drivers. But unlike India, journeys span in hours rather than days. Traveling by rail is maddeningly slow, but it's also a scenic, memorable experience to be enjoyed. Driving around the island by motorbike provides the highest level of freedom and doesn't take long. But the trucks and buses speeding recklessly along Sri Lanka's roadways are worse than usual; they're even enough to give veteran drivers in Asia the shakes. Don't attempt to drive on the island's main roads unless you're willing to play head-on chicken with fully loaded cargo trucks! Ferry service between India and Sri Lanka stopped during the civil war. Boat service started up again in late 2011 but did not run for long. Although some cruise ships do call into Sri Lanka, the easiest and most common way to reach the island is by flying into Colombo. Many budget airlines operate flights between major hubs in Asia and Sri Lanka. Flights from India are especially inexpensive. There are no direct flights from the United States to Sri Lanka. Travelers usually connect through Europe, Asia, or the Middle East. 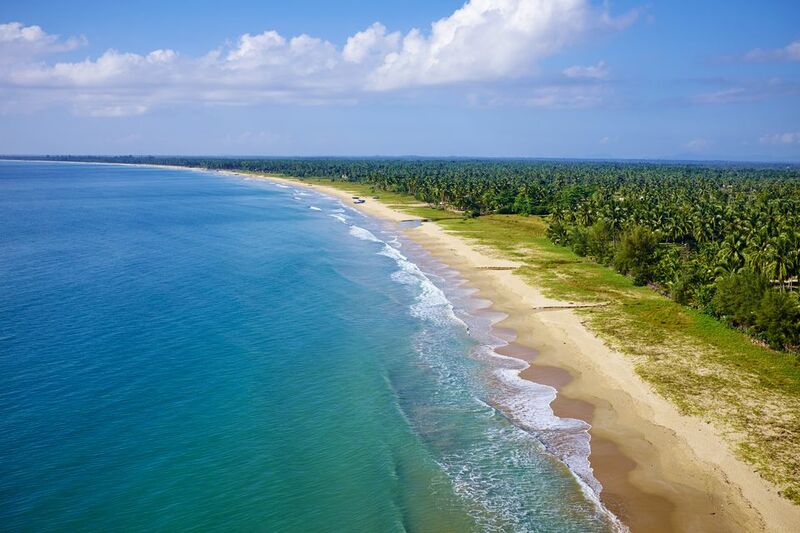 The quickest way to fly to Sri Lanka from the United States is to book a direct flight to New Delhi or Mumbai, then connect with an onward flight to Colombo. Another option, as with other points in Asia, is to pass through Bangkok. Bangkok is a popular hub for stopovers on the way to Sri Lanka, and no transit visa is required. Airfare to Bangkok is often very affordable from Los Angeles (LAX) and New York City (JFK). AirAsia operates affordable flights from Kuala Lumpur's KLIA2 terminal to Colombo. If you get a chance to fly with Sri Lankan Airlines, the national airline, do so! The airline consistently wins awards for friendly service and reliability. For once, you'll enjoy good food on a flight instead of being convinced someone is trying to injure you. You should arrange your first hotel before arriving in Colombo; it's the hectic, concrete heart of the island. Driving around the urban sprawl after hours looking for a place to stay isn't a good plan. Whatever you do, don't show up in Sri Lanka without a visa! People of all nationalities (excluding Singapore, the Maldives, and the Seychelles) must get an electronic visa (known as an ETA) in advance before arriving in Sri Lanka. After applying on the official ETA site, you will receive a confirmation code associated with your passport number. Travelers print that code then later receive a visa-on-arrival stamp at immigration after arriving in the airport. The process is pleasantly efficient, assuming you don't make any mistakes on the application. Applying for a travel visa to visit Sri Lanka is easy, inexpensive, and can be done quickly online — you do not need to pay an agency to help you get one. If for some reason the electronic process doesn't work, you can visit a Sri Lankan diplomatic mission to obtain a visa before flying to Colombo. The default length of stay granted for tourism is 30 days. Getting a visa for Sri Lanka is notoriously more straightforward than getting a visa for India; no passport photos or additional paperwork are necessary. Sri Lanka had to deal with both the devastating 2004 Indian Ocean Tsunami and a civil war that lasted for nearly 30 years. Fighting stopped in 2009, but the greatly empowered military has remained in a mobilized state for decades. Sri Lanka claims to have become the first country to completely eliminate terrorism on its soil. Heavily armed police and even machine gun nests are a common sighting in the city. The United Nations and other world organizations have claims against Sri Lanka for corruption, war crimes, torture, and the disappearance of over 12,000 individuals following the end of the war. The founder of a major newspaper — an outspoken critic of the government and human rights activist — was assassinated in 2009; no one was charged. Despite a heavy militarized police presence in Colombo and cities in the north, Sri Lanka is safe to travel with the usual amount of vigilance. Tourists don't get targeted beyond the usual travel scams. The tourism infrastructure has largely been rebuilt, and over two million foreign tourists a year come to Sri Lanka to enjoy the beauty and biodiversity. Tourism is growing extremely rapidly. A majority of the visitors to Sri Lanka end up at popular beach destinations south of Colombo along the west coast of the island. Unawatuna is a popular beach destination and attracts visitors from all over the world. Surfing and whale-sighting cruises are popular activities along the coast. The interior of the island is green, cooler at higher elevations, and home to abundant bird species and other wildlife, including elephants. Verdant tea plantations can be found among the hills. The island interior is rich with trekking and bird-watching opportunities. The city of Kandy in the Central Province is a popular tourist destination and is generally considered the cultural epicenter of Sri Lanka. The Sacred Relic of the Tooth of the Buddha is housed in a temple in Kandy. Even if lazy beach vacations aren't your thing, there are enough interesting things to do in Sri Lanka to make everyone happy. Peculiar for an island so small, Sri Lanka is subject to two different monsoon seasons. At any given time, some part of the island will be dry enough to enjoy while the other side experiences rain. For no good reason, you could technically drive to monsoon season and then come back to sunshine. The popular beaches in the south enjoy dry season from November to April. Meanwhile, northern parts of the island get rain. You will enjoy better snorkeling and diving during the dry season months when less runoff from the interior clouds visibility. Unlike India to the north, Buddhism (Theravada) is more prevalent in Sri Lanka than Hinduism or other religions. In fact, Sri Lanka is approximately 70 percent Buddhist. What is considered by many to be the most important Buddhist relic on earth, Buddha's left canine tooth recovered after his cremation, is kept at the Temple of the Tooth in Sri Lanka. Also, a sapling reputedly from the bodhi tree beneath which Buddha obtained enlightenment is planted in Sri Lanka. Sri Lanka is more devout and can be more vigilant about enforcing religious laws than the Buddhist countries in Southeast Asia. It is technically illegal to display religious tattoos (even the ones that are very popular in Southeast Asia). You could be denied entry or receive additional harassment from immigration officials if you don't cover up Buddhist and Hindu tattoos. By the law, they have the right to arrest you on the spot. Be extra respectful when visiting Buddhist temples and shrines. Don't turn your back to an image of Buddha to snap a selfie. Avoid making too much noise or acting disrespectful near temples. Avoid clothing with religious themes. Even a shirt that depicts an image of Buddha could be deemed as offensive. Be sightly more conservative when choosing clothing to wear.